Beloved Spear: Kurisumasu ni wa Kentakkii! As we bustled about, my Jewish children helping assemble the ancient plastic tree that has graced their grandparents house since the mid 1970s, my sixteen year old son gave me a grin. It was that grin kids get when they realize they know something their parents don't. "You seriously haven't heard about KFC? For Christmas? In Japan? Seriously?" "Oh, man. The Japanese aren't Christian, pretty much none of them. 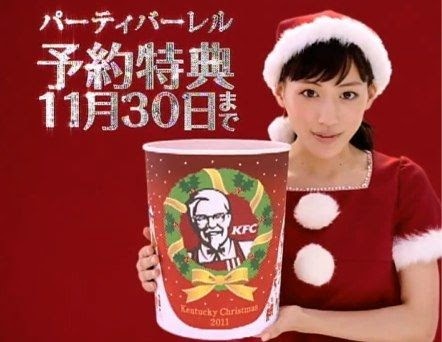 But they celebrate Christmas by all going to KFC. It's like this huge thing. Like, everybody goes. You totally need to look that up, Dad." And so I did. And as I goggled at the peculiarity of it, I thought, dang, how did I not know this? It was both very strange and oddly familiar. Very strange, in the way that seeing elements of your culture sorted, adjusted, and modified through the lens of other cultures is invariably bizarre, a funhouse mirror. Corporate culture, of course, is gleefully willing to spread itself. It's aggressively viral, embedding and adopting and engaging itself with every other form it encounters. Still and all, seeing the features of our seasonal festivities threaded into another culture is odd. Odder still is that there is absolutely zero connection between this event and any Christian connection. None whatsoever. Japan has some small Christian communities, but they're in a tiny minority. 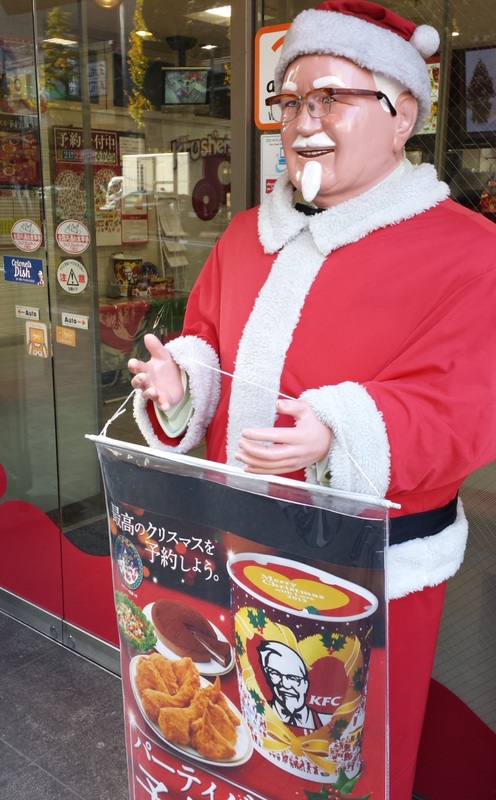 What happens in Japan on Christmas doesn't have the character of European or Slavic Christmases, which arise from a long, complex, and historic connection with the faith. Neither does it resemble the traditions that have arisen in Latin America, or in Africa. There is no faith component at all. It's the sort of tradition that arises solely from a particularly successful ad campaign, intentionally designed for a particular culture. It is pure, unadulterated, uncut secular Christmas. In that, it is remarkably like the Christmas we Americans can all observe around us right about this time every year. Just a slightly different white guy with a beard. Man, this planet is a strange place.